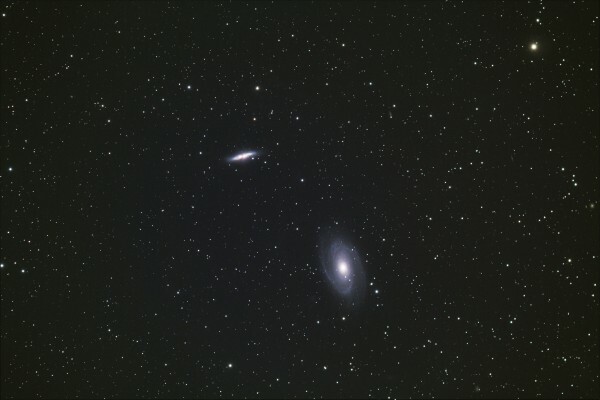 Here is 2hours 16 mins of 4min long DSLR exposures on galaxies M81 & M82. 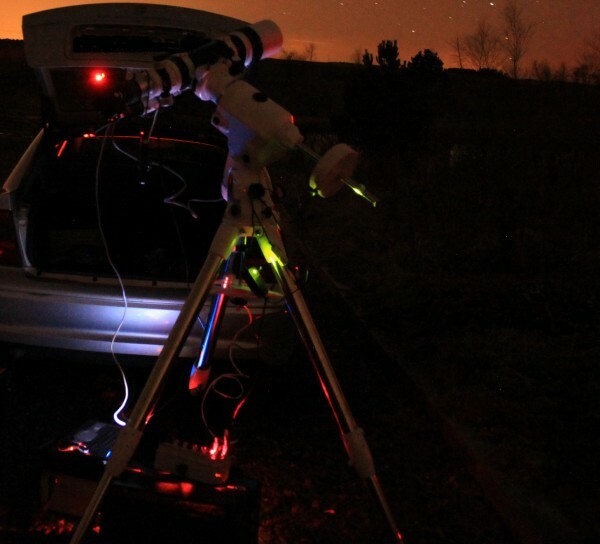 how visible is it by just looking through the telescope ? Amazing... I wonder what they're having for dinner in one of the small blobs at the upper right spiral arm. Thanks Phobos , looking through the scope with an eyepiece you can see 2 very small fuzzy grey streaks (a big scope will resolve a slight swirl shape). Thanks Stefan , if humans had a spaceship that could travel at the speed of light it would take roughly 11 million years to get there , dinner time may be finished then (i recon beef stew or fish n chips ). I even think I can find at least 5 more clear galaxies in that image... What kind of telescope, camera and camera-adapter do you need for deep space observations like that? i take my stuff in the car away from the town to set up a budget system i have built up over the years. I use a motorised equitorial mount (NEQ6) with a small telescope ( skywatcher 80ED + field flatnr/reducer = F6.4 at 500mm focal length) with a Canon 500D (modified infra red) taking pics , to keep the stars fairly round looking in the image i also use a guiding system which corrects any tracking errors. Any special considerations/problems when using a Digital SLR? ~20 years ago my kids and I used to get out with a Celestron 8" reflector and a conventional SLR, don't have the adapter for my DSLR, and the clock drive is rusted tight. Great photo! I like going out and spotting M81 naked eye (well, with glasses). Fuzzy area in the sky? Sure. But the impressive thing about naked eye is how much of the sky that remote galaxy fills up when you consider its dim, outer arms. The kids used to love staring through a color eyepiece filter at the full moon, saturating cones in the eye, so that when they took the filter away, they'd laugh and laugh at the color reversal across the moon-lit landscape. Kids. Thank you for the gear rundown, Dave! That mount looks like serious kit. Interesting to note that it seems to be the main investment (just did my periodic browsing of telescope shops, inspired by this thread). I suppose you want something really sturdy and precise for those kind of images. Always wanted a telescope, but it hasn't happened yet. I think you image just raised the bar too! I've got synths and studio gear though, and they can also take me pretty far into "space"
to keep the stars fairly round looking in the image i also use a guiding system which corrects any tracking errors. I was wondering what the guidance would do that the tracking would not, and asked Dave in the chat. He said that the guidance would focus on a star nearby in the field of view to use it to fine control the tracking - pretty nifty! Dave, I am impressed with the quality of this photo. Amazing stuff !! Granted, as points of light, but a little bit clearer than with my shortsighted naked eyes. I found the Southern Cross! No moon tonight, though. Couldn't see it around the general suburbia skyline.